Poverty continues to persist in many countries throughout the world despite improvements in the global trade regime and significant enhancement in agricultural productivity through the green revolution technologies. To achieve the millennium goal of halving poverty by 2015, these people should be provided with alternative production opportunities that can generate new employment and enhance incomes. Data from several countries reviewed in this study confirm that agricultural diversification can contribute to this. In a scenario of shrinking land and depleting water resources, the challenge of the new millennium is to increase biological yields to feed the ever-growing population without destroying the ecological foundation. It is thus important-not to package this challenge as a demand or imposition on farmers, for which they would bear the cost, but as a necessity and methodology to also sustain their welfare. 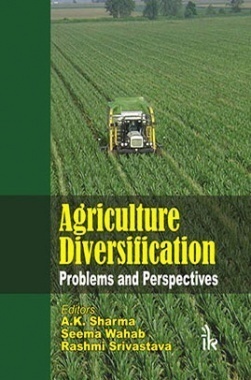 This book deals with different practices in agriculture diversification. Care has been taken to include applied aspects and present scenario of different practices necessary for agriculture to the diversification. The book will be of use to the students, researchers and progressive farmers. 1.Spread across 15 chapters, the book includes policies and applications of different resources with respect to agricultural diversification. 2.Contemporary topics like transfer of technology, integrated pest management system, biofertilizers etc. have been covered appropriately. 3.A separate chapter has been given on rehabilitation of degraded lands.